In a newly published study, researchers tested the effects of reducing ether lipids on human skin cancer cells and primary breast tumors, finding that inactivating an enzyme critical to the formation of ether lipids substantially reduced the aggressiveness of the cancer cells. Berkeley — Knocking out a single enzyme dramatically cripples the ability of aggressive cancer cells to spread and grow tumors, offering a promising new target in the development of cancer treatments, according to a new study by researchers at the University of California, Berkeley. Researchers have long known that cancer cells metabolize lipids differently than normal cells. Levels of ether lipids – a class of lipids that are harder to break down – are particularly elevated in highly malignant tumors, although the nature of that correlation has been unclear for decades. In the study, Nomura and his team tested the effects of reducing ether lipids on human skin cancer cells and primary breast tumors. They targeted an enzyme, alkylglycerone phosphate synthase, or AGPS, known to be critical to the formation of ether lipids. The researchers first confirmed that AGPS expression increased when normal cells turned cancerous. They then found that inactivating AGPS substantially reduced the aggressiveness of the cancer cells. The researchers also compared the impact of disabling the AGPS enzyme in mice that had been injected with cancer cells. The researchers determined that inhibiting AGPS expression depleted the cancer cells of ether lipids. They also found that AGPS altered levels of other types of lipids important to the ability of the cancer cells to survive and spread, including prostaglandins and acyl phospholipids. Future steps include the development of AGPS inhibitors for use in cancer therapy, said Nomura. “This study sheds considerable light on the important role that AGPS plays in ether lipid metabolism in cancer cells, and it suggests that inhibitors of this enzyme could impair tumor formation,” said Benjamin Cravatt, professor and chair of chemical physiology at The Scripps Research Institute, who is not part of the UC Berkeley study. Cravatt is an expert in the role enzymes play in human diseases. Other study co-authors include Kunxin Luo, UC Berkeley professor of molecular and cell biology and faculty scientist at the Lawrence Berkeley National Laboratory. The National Institutes of Health and the Searle Scholar Foundation helped support this research. 1 Comment on "Inactivating AGPS Enzyme Reduces Tumor Growth, Cripples Cancer Cells"
Inhibiting Alkyl Glycerone Phosphate Synthetase (AGPS) essential for synthesis of lipids from carbohydrates which enables the cell to form its membrane is a good route for cancer control. There are only three basic methods to control cancer tissues. 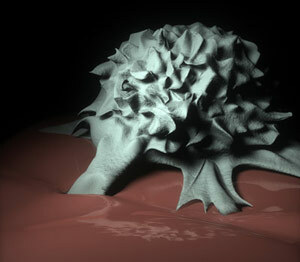 1)Destroy it completely using radioactive chemicals and radiation, which will harm the other normal cells too 2)Stop Metastasis or spreading of malignant cells to other parts by targetting at the stem cells which when attached to the normal function of producing different cells is corrupted and piggy backed by tumor cells to alter their functions,like how virus does.3)Stop the supply of raw materials to form the cell membrane an important part of the cell by controlling formation of lipids required as explained in the article.This method is laudable but it should be too specific as otherwise apoptosis will occur in the growth of normal cells also. Thank You.